Much of Eisenhower's popularity as a politician was based on his role as Supreme Allied Commander during the end of World War II - shown here at the WWII victory parade in New York City. The 1952 United States presidential election in New York took place on November 4, 1952. All contemporary 48 states were part of the 1952 United States presidential election. New York voters chose 45 electors to the Electoral College, which selected the president and vice president. New York was won by former Supreme Allied Commander and World War II hero, Republican Dwight D. Eisenhower, who was running against Democratic Governor of Illinois Adlai Stevenson. Eisenhower ran with California Senator Richard Nixon as Vice President, and Stevenson ran with Alabama Senator John Sparkman. 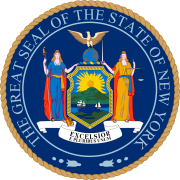 The presidential election of 1952 was a very partisan election for New York, with 99% of the electorate casting votes for either the Republican Party or the Democratic Party. Eisenhower proved to be very popular in many of the Northern and Mid-West States, and took nearly every county in the State of New York, with the exception of a handful of counties conglomerate with New York City. The only counties in the state to vote for Stevenson were the New York City boroughs of Manhattan, Brooklyn, and the Bronx, allowing Stevenson to win New York City overall. Eisenhower ultimately won election to the White House in 1952 as a war hero, a political outsider, and a moderate Republican who pledged to protect and support popular New Deal Democratic policies, finally ending 20 years of Democratic control of the White House. Eisenhower won the election in New York (his home state) by a decisive 12 point margin. National turnout for the presidential election of 1952 is evident of the contemporary, lingering Democratic stronghold in the Deep South, which was the only region to vote primarily for Stevenson. Eisenhower was the first presidential candidate in United States history (and largely, globally as well) who targeted a large portion of his campaign to women voters. Dwindling popularity for the administration of Truman during the months following the conflict in Korea, and coupled with the relatively progressive agenda and campaign strategy laid down by the Republican Party, contributed to Eisenhower's powerful rise across the country. ^ "Dave Leip's Atlas of U.S. Presidential Elections". Uselectionatlas.org. Retrieved 2013-07-14. ^ "1952: The Election of a Military Hero". The Press and the Presidency. Kennesaw State University, Department of Political Science & International Affairs. Archived from the original on 2009-04-20. Retrieved 2013-05-14.